Seemingly mundane objects can evoke different thoughts, reactions and memories in people. Say for example, the unassuming pineapple. When my father-in-law saw this pineapple skirt, he told me I should wear it when a certain relative he is not too fond of comes to visit and it's time for her to go home. You see, traditionally in the South, hosts put a pineapple in the guest's room to signify that it's time for the guest to leave. For me, pineapples remind me of a class I taught a few years ago that was obsessed with my wardrobe. 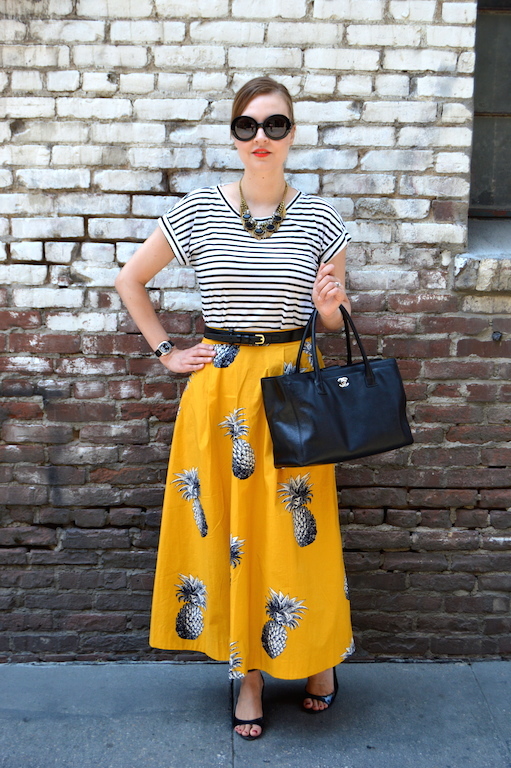 I had another pineapple skirt that I occasionally wore to school and somehow that became a symbol of our class. In fact, they even did a yearbook feature about their favorite teacher and bought a pineapple for the picture, which represented the "eccentric" wardrobe of their teacher, yours truly. The things that end up having a lasting impression on students often amazes me; they won't remember what deus ex machina is, but they will remember what you wore last Tuesday! My husband also makes fun of my "addiction" to pineapples, which I am putting in quotation marks because I have all of two items with pineapples. Actually, now that I think about it, the number is a bit higher, maybe 4 or 5, but that hardly qualifies as an addiction! 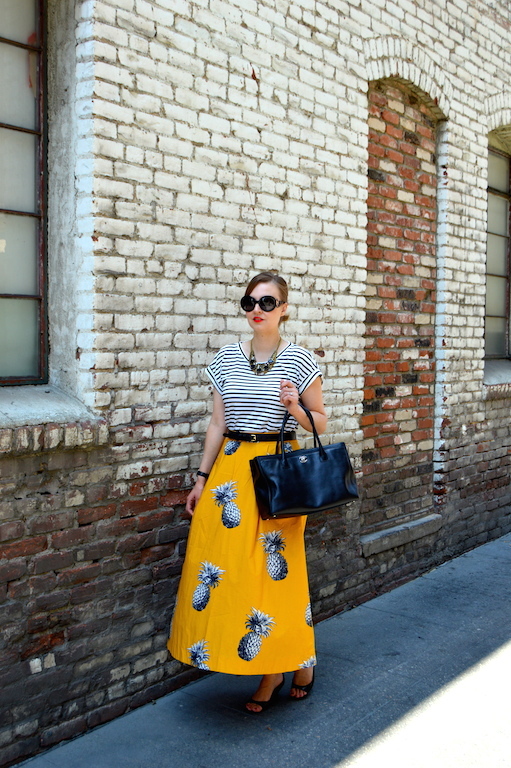 Unfortunately, this maxi skirt from Ann Taylor is no longer available, but below I have selected some other pineapple themed items for those of you who may also be harboring your own addiction to pineapples. Gorgeous. I love the skirt and your styling is perfection! That is such a fun skirt! I like the print mixing with the striped tee too, great piece to wear with it. Never knew about the tradition of putting a pineapple in a room either - how funny! That skirt is great and love the black and white stripes with it. Ha, for us, when you want someone to leave, you supposedly take the broom and place it behind the door. I love the pineapple skirt, and I have to say I always paid attention to what my teachers wore too (especially if they had fun wardrobes like yours!). This one is so cute with the stripes--such a fun print mix! That skirt is so fun! 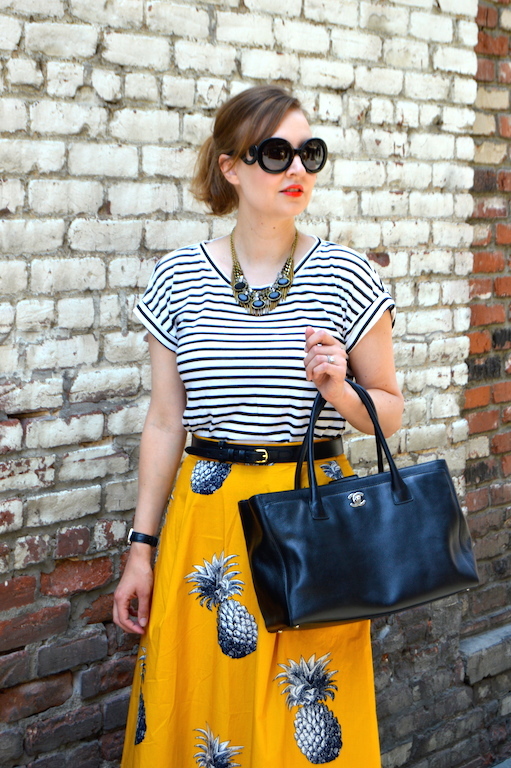 Love pineapple prints! 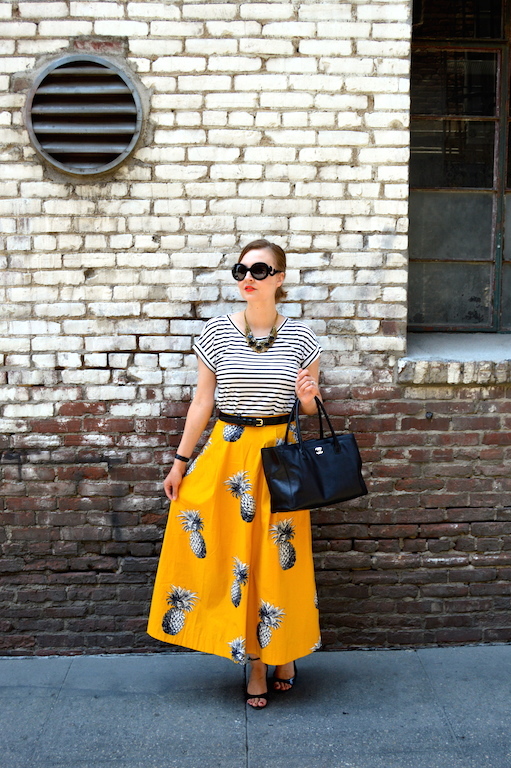 I don't know why pineapple prints are so adorable, but they just are! This skirt is AMAZING! I love the color and the giant pineapple print is magnificent. Styled with the striped tee is absolute perfection. This is one of my favorite outfits ever of any blogger that I follow! I want all of these pieces for my own! Gah...swooning. I would love for you to stop by and link it up On the Edge of the Week! Have a fabulous week. Awwww KATIE I missed out on this gorgeous skirt from Ann Taylor. I waited for it to go on sale and then my local store only had a size 8 left which was so big. For reference, what size are you wearing? I bought anything with pineapple for the first time this year: a necklace and a couple of graphic tees. Love your styling of this skirt, your story here and what your sweet students remember about you. They have such a bold stylish teacher! I am wearing a size 4, which was all they had left when I ordered it from the website. My normal size is a 4 in skirts, but I would say this runs a little bit big. You could probably size down one size in this one. I hope that helps!